Canal of Venice tapestry shows a scene of canals and bridges in Venice. The city of canals, made up of islands joined by bridges, is a phenomenon of cityscapes, and here we see the colorful sienna colored buildings, and cobblestone streets, with flowers decorating the scene, and a reflection on the water. 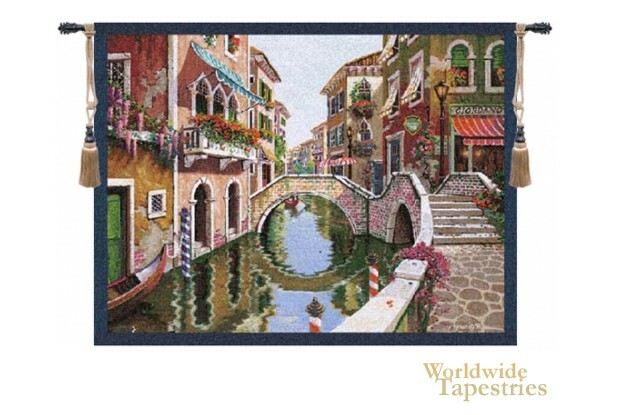 This "Canal of Venice" tapestry is backed with a lining and has a tunnel for easy hanging. Note: tapestry rod and accessories, where pictured, are not included in the price. Dimensions: W 34" x H 26"
Dimensions: W 43" x H 33"
Dimensions: W 52" x H 38"
Dimensions: W 75" x H 56"